Chapter One: "Enter the New DigiDestined"
Chapter Two: "The Digimon Emperor"
Chapter Three: "Spiraling Out Of Control"
Adapts "Ken's Secret," "The Emperor's New Home," "The Captive Digimon" and "Storm Of Friendship"
As the Emperor completes his latest invention, the Dark Spiral, Davis attempts to convince the others of his suspicion that the Emperor is Ken Ichijouji. The debate is interrupted, however, by Izzy, who has received a distress call from Agumon, who has fallen victim to a Dark Spiral. While Tai and the new kids search for him, they come across three new Digi-Eggs, but the Emperor and Agumon appear, and the Emperor forces him to Dark Digivolve into a viral version of MetalGreymon. The existing Armour Digimon don't have the power to defeat him, but by using the new Digi-Eggs, the kids Digivolve their Digimon into new forms, who are able to destroy the Dark Spiral. When Davis turns on the Emperor, he confirms Davis's fears - he is Ken Ichijouji. Adapts "An Old Enemy Returns," "The Darkness Before Dawn" and "The Crest of Kindness"
Chapter Five: "To Forgive is Divine"
Adapts "The Crest of Kindness," "Davis Cries Wolfmon," "If I had a Tail Hammer" and "Spirit Needle." Ken can't believe that Wormmon sacrificed his life for him, and leaves the DigiDestined to restore the damaged DigiWorld. The mysterious woman observes their repair work, and uses a technique called "Spirit Needle" to transform three Control Spires into a Tortomon, a Minotarumon and a Thundermon. Davis battles the Tortomon, and, with the help of a strange new Digimon, is able to Digivolve Veemon naturally, into ExVeemon, who destroys Tortomon. He meets up with Yolei and Aquilamon - Hawkmon's Digivolved form - who were attacked by the Minotarumon, then head to help Cody. He has already found help, however, in the form of the mystery Digimon - who, it transpires, is Stingmon, the Champion form of Wormmon. Ken appears and advises Cody to Digivolve Armadillomon naturally, into Ankylomon. Ankylomon destroyed Thundermon, and Ken then attempts to make his peace with the DigiDestined. Adapts "United We Stand" and "Fusion Confusion"
When Izzy detects a massing of energy at the site of the Emperor's crashed base, the DigiDestined spring into action. The mysterious woman, instigator of the danger, taunts Ken, causing him to arrive on the scene, just as the other kids and Digimon are battling Okuwamon. Ken has just received the Crest of Kindness, and believes he can use it to seal the impending explosion. When he and Davis team up, ExVeemon and Stingmon DNA Digivolve into Paildramon, who holds off Okuwamon while the two boys try to seal the base reactor. When the Crest fails, Paildramon destroys Okuwamon, and then the reactor. But Ken still can't forgive himself and leaves the other kids behind... as the mysterious woman's anger grows. Chapter Seven: "Along Came a Spider"
Adapts "Arukenimon's Tangled Web," "Ultimate Anti-Hero" and "Opposites Attract"
The mysterious woman confronts the DigiDestined and reveals her true form - Arukenimon, a spider Digimon. As the Digimon battle her, Davis sends Kari and Yolei to find Ken, who is in a forest, trying to resist the pull of the "Dark Ocean." The girls locate him, and Kari saves Yolei when she falls off a cliff edge. They return to the battle in time, and Paildramon is formed, but when he injures Arukenimon, her partner, Mummymon, enters the fray and they escape to safety. The DigiDestined pursue them, but Arukenimon strikes back with her latest Control Spire creation - the mighty BlackWarGreymon. Paildramon is defeated by this new monster, but then Yolei and Kari are able to achieve a DNA Digivolution, merging Gatomon and Aquilamon into Silphymon, who is able to beat BlackWarGreymon back. On the cast page for this volume, the listings for Davis, Yolei and Cody also include their Japanese names - something that the 01 dub did for its characters, but that the 02 dub did not - listing them as: Daisuke "Davis" Motomiya, Miyako "Yolei" Inoue and Iori "Cody" Hida. T.K. 's surname is misspelled as "Takakashi," as opposed to "Takaishi," and the trend of spelling his name without the periods continues. Silphymon is referred to as a she. The events of "The Digiteam Complete" and "A New Digitude" are omitted, and Davis, Yolei, Cody, T.K. and Kari all get their Digi-Eggs, and Veemon, Hawkmon and Armadillomon are released, at the same time. In an inexplicable change, it is T.K. who touches the Digi-Egg of Courage and releases the D-3s, rather than Tai, and it is an Airdramon who attacks them, rather than a Monochromon. "Iron Vegiemon," "Old Reliable," "Family Picnic" and "Guardian Angel" are completely omitted, though their events are inferred as having occurred at the start of chapter two during a recap by Davis, in a panel that shows Ebidramon and Roachmon. The events of "The Emperor's New Home" are all but removed, leaving only the Emperor's capture of Agumon. Appearances by SkullGreymon are, obviously, gone, and are also removed from "The Captive Digimon." The unmasking of the Emperor occurs at the end of "Storm of Friendship," rather than "Ken's Secret." The events of "His Master's Voice" are totally gone. Aside from one referenceto it by Ken in chapter seven, the Dark Ocean plays no part in the manga. The events of "The Samurai of Sincerity," "Big Trouble in Little Edo," "20,000 Digi-Leagues Under the Sea," "Ghost of a Chance" and "Run Yolei Run" are omitted, and Yolei and Cody find their second Digi-Eggs at the same time as Davis does. The events of these episodes (or at least, this universe's version of them) are alluded to in another recap by Davis, which mentions further battles with the Emperor. The events of the "Digimon Emperor's Revenge" trilogy are seriously compressed. Devimon makes no appearance in the Dark Whirlpool, and events do not take the form of a series of battles - it's all just one big fight with Kimeramon, who runs amok for no clearly-stated reason. Further, due to the compression that everything has undergone up to this point, Wormmon has received barely any attention at all, so his sacrifice to help Magnamon comes off as rather emotionless. In a rather surprising omission, the pivotal episode, "Genesis of Evil," is outta there. As a consequence, Wormmon's return to life goes unexplained, even though T.K. later comments on it. The previously individual stories, "Davis Cries Wolfmon," "If I had a Tail Hammer" and "Spirit Needle," are rather nicely adapted into one combined tale. The Tortomon from "Davies Cries Wolfmon" is now a Control Spire Digimon, while the Digimon that Yolei and Hawkmon battle is a Minotarumon, rather than a Golemon, as it was in the show (the events of that battle are not shown, in any case). 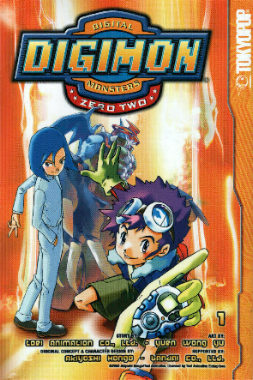 It is Ken and Stingmon who advise the kids to Digivolve their Digimon naturally, rather than have it happen of its own accord, meaning Davis is not pursued clean across the DigiWorld, and Cody is not buried in a cave-in. Ken did not receive the Crest of Kindness in chapter four or five, so it's sudden appearance in chapter six is burdened with some simplistic exposition, where Ken says he "just received" it. The explanation for the inability of the original Digimon to Digivolve is omitted - which actually doesn't matter, because pretty much everything they do in the anime is excluded from the manga, so it's not an issue of importance in it. The entirety of "The Insect Master's Trap" is dropped - the Giga House doesn't appear at all, and Arukenimon's first direction interaction with the kids is her attack on them, beginning with her revealing her true form, adapted from the later scenes of "Arukenimon's Tangled Web," except occurring in the desert. When Mummymon rescues her, he does not reveal his true form. "Ultimate Anti-Hero" and "Opposites Attract" are also nicely combined with these scenes to form a united story - Ken's absence in "Ultimate Anti-Hero" is made into an absence during the first battle with Arukenimon, and his experiences in the forest with Yolei and Kari from "Opposites Attract" take place when they come looking for him. Consequently, Ken is not absent during the battle with BlackWarGreymon, but Paildramon fails to defeat BlackWarGreymon, unlike the anime, and Silphymon's first appearance sees him claim the victory. Although the manga has been very consistent about using dub names, terms and character portrayals, in 02, it sticks by the Japanese chronology, giving the time between 01 and 02 as three years, rather than the dub's four years. Davis's portrayal seems more "hip" than even the dub presents him to be, having him make us of phrases like "dag," "mad skillz," "bling-bling," "homeslice" and "peace out." Justin Lam notes that this interpretation of the character seems to be based more on Brian Donovan's vocal portrayal of Davis, rather than Nimoy and Buchholz's actual English dialogue for him. The first chapter establishes that Davis "loves noodles," nicely foreshadowing his future career. An artistic error sees the Digi-Eggs of Sincerity and Reliability appear in place of the Digi-Eggs of Hope and Light for one panel on page twenty. Also, in the three views we get of the row of five Digi-Eggs (including the incorrect one), the eggs are never in the same order. The title of chapter three misspells "Spiralling" as "Spiraling." The picture of Arukenimon on the title page of chapter seven is copied directly from her animation model sheet.